Personalise your nutrition with three all in one plant-based nutrient powder blends. 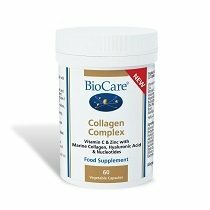 Collagen Complex provides the structural and protective nutrients to nourish and support us from the inside out – from bone and joints to ligaments and through to our skin. 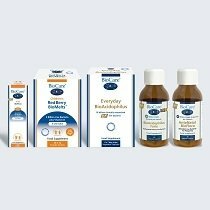 Our range of live bacteria supplements contains something for all the family. Don’t miss out on all of the great advantages of becoming a BioCare® Practitioner, just complete the simple on-line form today and start enjoying the benefits. How will you be using your BioCare® account? Where do you normally buy supplements? Would you like to join our Practitioner Referral scheme? The practitioner Referral scheme enables you to refer your clients to BioCare® to order directly and receive a discount and/or you can be paid up to 25% commission each month on their purchases. Our Practitioner Referral scheme allows you to take a commission from any supplement sales that your clients make when they quote your unique code. 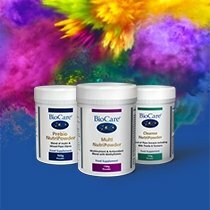 You can choose to take all or part of a 25% discount and use the remainder to pass on to you client so they can purchase the BioCare® supplements you recommend at a reduced cost to them. You'll receive your unique code once we've processed your registration. You will receive a monthly statement which shows the commission you have earned. *How much of your 25% would you like to receive as a commission payment? *How much commission would you like to pass on to your clients? Please provide the details of the bank where you would like commissions to be paid. Would you like to apply for a credit account? This is some information for our tooltip. Would you like to add another Company Director/Partner? Please tick the boxes below to confirm the ways you prefer to hear from us. After you've opted in we'll keep up to date on the latest BioCare news, events, health articles, product information and exclusive offer and promotions*. *This is an accordance with European data protection laws known as the General Data Protection Regulation (GDPR), which is in effect from May 2018. For more information please visit ico.org.uk. Why become a BioCare® Practitioner? Join us for exclusive advanced education at our nationwide events. Watch regular online events featuring carefully chosen experts in their field. Access our vast library of educational tools at a time to suit you. Take a full commission or share your discount with your clients. Receive a competitive discount on BioCare® products. Order for your clients and have products sent to them to aid compliance. Get expert advice from our Clinical Nutrition team to help guide you through our range. Customer Services If you have any queries regarding BioCare products, recent orders or the website, please feel free to contact us.